You may not have noticed the new addition to our church sign but the words have a special meaning as explained below by David Layman. Although active church members might not like to acknowledge it, many today consider Christians to be of sour disposition. To them the faith is a list of things we ought not to do. Yet the historic Westminster Shorter Catechism begins saying our “chief end” in life is to “glorify God, and enjoy him forever.” Our primary purpose in life is not to become famous or prosperous–although such an outcome would not be unwelcome! Our primary purpose is to glorify, and enjoy God. Many people spend very little time thinking about God. Their lives are focussed primarily upon themselves. The Bible is not an easy book to read and understand. But as we read and begin to understand the Bible, and especially as we study Jesus, we begin to understand how God wants us to live. Some outside the church (even some within it!) think a life of faith in God is boring and dreary, but the opposite is true! It’s life’s greatest adventure to learn of the amazing world God created…to listen to and participate in some of the beautiful music God inspired….to accept God’s challenge to love God with all our heart, soul and mind–and our neighbor as ourself! It’s fun to do this, and exciting…we are called upon not just to glorify God, but to enjoy Him! The average person may presume serving God may be a dreary responsibility, but certainly not “enjoyable”. But we may enjoy God in many ways. God has created a beautiful , interesting and enjoyable world. We may enjoy God through nature….seeing a hummingbird fly, a beautiful sunrise or sunset, standing on the shore of the ocean, feeling the sea breeze, looking at its’ vastness, and thinking of God! Not only may we enjoy the wonders of God’s created order… we can enjoy great fellowship with people God has created. One can always find people one is disappointed with, even in the church. 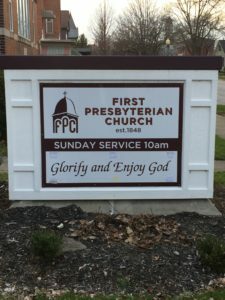 But in First Presbyterian Noblesville can be found people that are a real blessing and encouragement. My hope is these 4 words on our sign might get some thinking, come inside, and give our church a try.